On October 11, 2009 Father Damien was canonized by Pope Benedict XVI, and is now known as Saint Damien de Veuster of Molokai. He is considered the spiritual patron for Hansen’s disease, HIV/AIDS patients, and outcasts. The original painting has become part of the Vatican’s art collection. Beloved watercolor artist, Peggy Chun, passed on in 2008 after a 6-year battle with Amyotrophic Lateral Sclerosis (ALS). Towards the end of her life she was completely paralyzed except for the movement of her eyes. Peggy’s heart, though, remained courageous, and she never lost her passion for life and creativity. Peggy kept finding ways to paint throughout each stage of her paralysis. Once her left hand lost its strength, she switched to her right hand until it failed; she then used her mouth until unable to hold a brush. Finally she spelled out words using her eyes and a spelling board, giving detailed instructions, letter-by-letter, regarding composition and color of her final artistic creations. The painting of Father Damien is a testament to this endeavor. It began in 2006, when Peggy spelled out her vision to create a portrait of Blessed Father Damien, a Belgian missionary priest, who in 1873 volunteered to attend to the needs of the victims of Hansen’s disease, formerly known as leprosy. Those afflicted had been placed in quarantine and were banned as outcasts on Kalaupapa peninsula, Island of Molokai . To create this masterpiece, Peggy enlisted the assistance of the students of Holy Trinity School, an elementary school in Hawaii. With help from their teacher (and friend/caregiver to Peggy) Shelly Mecum, Peggy “borrowed” the hands of the entire school to paint half-inch squares of watercolor paper that would be used to create the mosaic effect of the artwork. Peggy spelled out instructions and paint formulas for the children who painted more than 50,000 squares over the course of 18 months. To help execute her vision for the portrait and assemble the mosaic pieces, Peggy called upon friend and fellow artist, Magdalena Hawajska. Magdalena, a talented Polish artist, was living in Poland when Peggy asked for her assistance. Magdalena felt that this was her calling. And so, through the generosity of a few angels, Magdalena was soon on a plane from Poland to Hawaii. And thus began what she has described as a spiritual journey, with Peggy as her guide. Peggy had a very specific vision of this portrait. She and Magdalena spent endless hours discussing each detail. The result is nothing short of miraculous. There is meaning and symbolism behind every detail, power within every one of the tiny masterpieces the children created. The sky is graduating from dark to light, symbolizing that through his love and compassion, Father Damien brought these abandoned people from darkness to Light. The Molokai cliffs on the right side of the painting represent that Father Damien moved mountains with Love (Magdalena, a restoration artist by trade, painted the Molokai cliffs as a replica of Peggy’s watercolor painting “Molokai”). Father Damien was a strong man and a reflection of the spiritual Light, which is represented by the bright side of his face. Like many great visionaries, he also suffered from loneliness and dark thoughts, which is represented by the dark side of his face. Those suffering from Hansen’s disease were considered untouchable, but Father Damien attended to their wounds and touched them all, eventually contracting the disease himself. His willingness to help and touch the patients is represented by his hand holding an authentic impression of Peggy’s hand. The many hands along the bottom of the painting are impressions of the hands of Peggy’s loved ones thus giving energy and special meaning to the work. These hands reaching out for help symbolize a call for God’s mercy and healing power, God is being represented by the radiating sun at the center of the painting. This entry was posted on Wednesday, December 9th, 2009 at 3:27 pm. 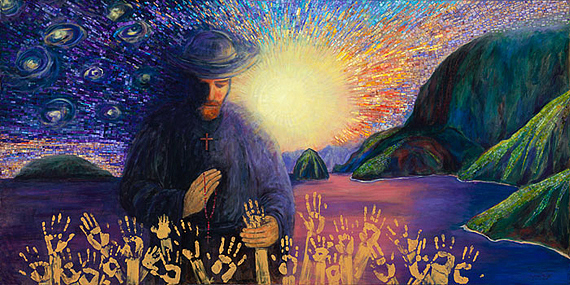 It is filed under Pacifica's Artists and tagged with ALS, Father Damien of Molokai, featured, Hansen's Disease, Hawaii, hawaiian, Hawaiian art, hawaiian art prints, hawaiian artist, Hawaiian poster, Kalaupapa, Leprosy, Molokai, New, Patron Saint of HIV & AIDS patient, Peggy Chun, Pope Benedict XVI, Saint Damien de Veuster, Vatican, watercolor painting. You can follow any responses to this entry through the RSS 2.0 feed.